Interface design is typically focused on optimizing the efficiency of a specific task. However, this goal of efficiency often leads to interface designs that displace the user from his or her embodied experience and physical location. While this displacement may be appropriate for some computing applications that rely solely on the analysis of raw data, there are several applications that would benefit from a strong connection to their physical context. This research project seeks to explore this general problem through the example of architectural design. Like many computer interfaces, traditional approaches to architectural design often distance the architect from the direct experience of the building by placing an emphasis on planometric drawings and quantitative analysis. This research focuses on the disconnection that one is forced to reconcile between site and designed building. 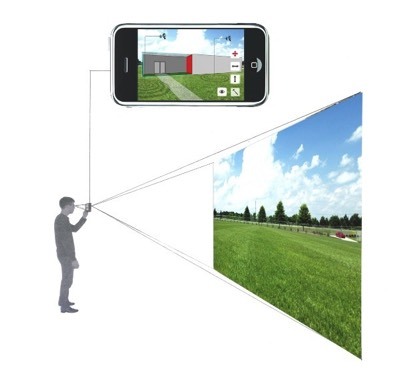 The ArchInSite project is attempting to close this gap by integrating augmented reality application(s) within a mobile device to essentially bring the virtual world and embed it within the actual context. By creating a piece of software that integrates GPS, video compositing, a digital compass and virtualization an architect is capable of seeing, an moving around their virtually designed building on the site for which it was designed. While still in the developmental stages this project shows great promise in its influence of the design process, potentially within education and within the architectural profession.